For Sen. Bernie Sanders (I., Vt.), former Senate colleague Joe Lieberman is an unacceptable choice to serve as the next FBI director. Lieberman's views are too "extreme," according to Sanders, a self-identified democratic socialist. Lieberman's name emerged on Thursday as the frontrunner to replace fired FBI Director James Comey. Since then, numerous Democrats, in and out of the Senate, have voiced their opposition to Lieberman. Critics have expressed concern about Lieberman's lack of federal law enforcement experience, past partisan activity, and possible connections to President Trump through the law firm at which Lieberman currently works. Now, Sanders has joined the chorus. Tweeting on Friday afternoon, Sanders said that Lieberman failed to meet his bar because he would be "perceived as a political appointee." "Lieberman's political history and extreme views on a number of issues would make him a divisive nominee," Sanders wrote. "That is not what we need now." Joe Lieberman's political history and extreme views on a number of issues, would make him a divisive nominee. That is not what we need now. Lieberman was generally regarded as a moderate during his time in the Senate; he was described as such by the New York Times when his party selected him as its vice presidential nominee in 2000. During the 2016 election cycle, he joined with Gov. John Huntsman (R., Utah) to advocate for a "national moderate agenda." 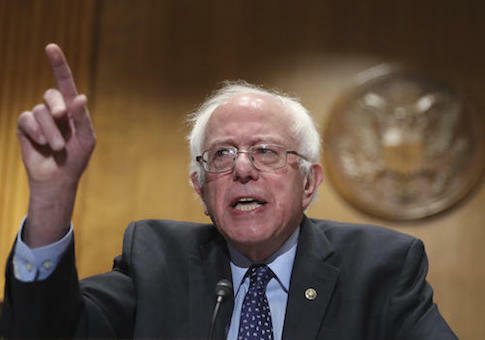 Sanders was recently ranked the least bipartisan member of the 114th Congress by a ranking distributed by the Lugar Center and Georgetown University's McCourt School of Public Policy. This entry was posted in Politics and tagged Bernie Sanders, FBI, Joe Lieberman. Bookmark the permalink.